EUCLID has its origin in a cooperative academic program hosted by the University Bangui in 2006-2008, during the tenure of Professor Faustin Touadera (later on Prime Minister Touadera and more recent President of the country) as rector of the university. In late 2010 and during 2013, the “elegant” (coquette) capital city was affected by political and civil instability. for this reason, EUCLID’s operational headquarters were relocated to The Gambia in West Africa in 2013, Gambia being a country noted for its stability and touristic appeal. iN 2015, Constitutional order and safetyreturned to the capital city of Bangui in 2015, and the situation is quite normal as of 2016, owing to a large extent to the work of President Touadera’s government with the support of the international community. Today, downtown Bangui is a much safer that many other Western cities such as Miami or Marseilles, and many investors and visitors are returning to the capital. EUCLID liaison officers can help arrange a successful visit. Photo above: EUCLID’s historic offices in the Prime Minister’s tower known as Tour Pétroca. 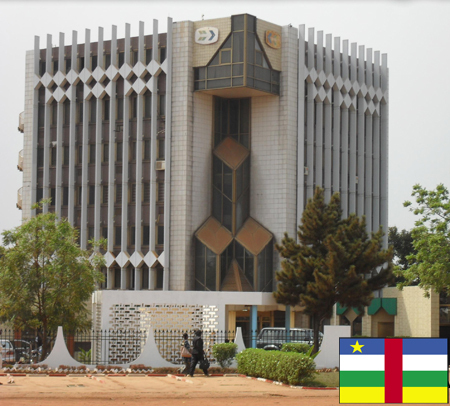 EUCLID’s offices are now located in the ENAM buildings (Ecole Nationale d’Administration et de Magistrature).